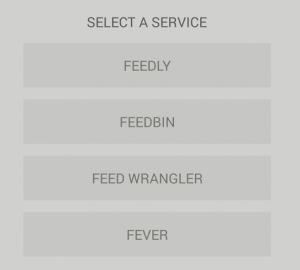 Press is a RSS app that synchronizes with lots of news services, including Fedd Wrangler, Feedbin, Feedely and Fever, among others. It is a simple and functional app with a clean, easy and modern interface. It has a very intuitive interface with your RSS featured in three columns: unread, read and starred. You can easily switch from one column to the other, where the items are grouped by folders (as you have configured) in which we can see the number of unread items and the total amount of items present in the folder. You can access within each folder, check the articles displayed as a list, and with easily come back to the upper level folders. From the Setup menu, you can choose the frequency of synchronization, set a maximum number of items, and change the interface options, among others. However, the most important feature for a news reader is readability and Press nails it. The text is perfectly suited to any screen, for both smartphones and tablets, and pictures fits nicely too. It includes standard Android sources, and we can also choose between all the most popular sources of Google Fonts. If you double -click ion an image, it opens on the viewer, where we can easily zoom to see the details. To open an item, you only need to double-click on any part of the article. Press is a worthy rival iOS apps such as Reeder and Mr. 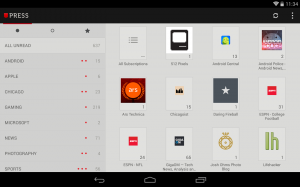 Reader, and it is emerging as one of the best Android news readers available on the Play Store. Priced at $2.99, it is a very good option to include in our devices. You need the Ice Cream Sandwitch version or higher to run this application, which you can download from the Google Play.